So it looks like Eliana, the $1 hot dog lady on the NW corner of 43rd and 6th, has survived the onslaught. You might remember that she was part of the crew of carts that got kicked out of that spot by the cops awhile back for parking on a sidewalk that was supposedly too narrow to be a legal vending spot for carts. She even had her cart confiscated, despite the fact that later measurements clearly showed that the sidewalk was the proper width. The other two carts (which included the 3rd El Rey del Sabor cart) decided to cut their losses and set up on the NE corner of 43rd and 6th. Eliana tried that for a bit but, after working the opposite corner for many years without issue, she was eager to return. Thankfully the Street Vendor Project (which hosts the Vendy Awards every year) stepped in and not only helped her get her cart back but also helped deflect any other obstacles to her returning to her original corner. It looks like she’s there for good again (on the NW corner of 43rd and 6th), and last week I decided to swing by and actually try one of these $1 hot dogs. 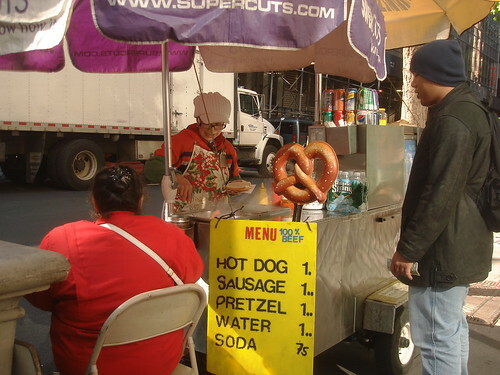 I’m sure there are better hot dogs to be had in Midtown (and feel free to suggest some in the comments) but none as cheap as a $1, and I doubt they’re served as somebody as friendly as Eliana. Eliana’s $1 Hot Dogs, NE Corner of 43rd and 6th. Posted by Zach Brooks at 11:45 am, November 2nd, 2009 under 43rd btw. B'way+6th, Cart, Hot Dogs. I take exception to your description of the onions as “grilled.” These are onions in sauce, not grilled onions. And I’m with stevenp – why ketchup? 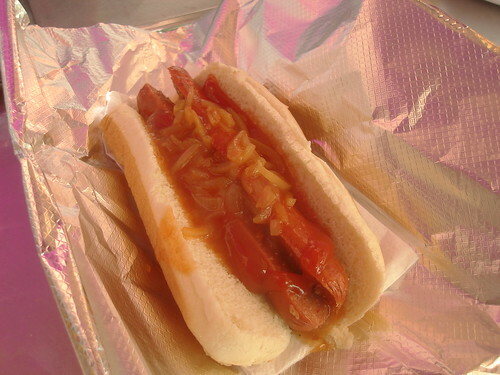 Although the sauce of the onions in sauce is tomato based, there’s no reason to add ketchup to that mix. Anyone know if her $1 pretzels have that ridiculous burnt smell like so many of the vendors? The thing sitting on the folding chair and sporting the red shirt, clearly enjoys Eliana’s hot dogs as well. Mustard and oniion sauce (with a lil’ relish) are my preferred hot dog condiments. Sauerkraut and mustard together…gross. RBS05: Why are you tasting vendors?